Kneel before Zod!!! I don't think so. Why do tyrants always what accolades and worship? Look at most every US President. 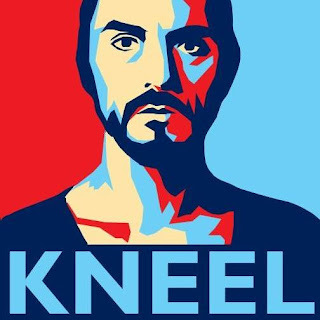 They might not demand worship like Zod, but they sure do accept it. Some US President's even demand in it, even if in is a convoluted way. They demand the Congress, the people's representatives, do their will, and if not they will go around them. Teddy Roosevelt, FDR and Obama come to mind. Well Lord Acton said it best. "Power corrupts and absolute power corrupts absolutely". Government, mostly through Congress, has given presidents what King George, enemy of the revolution, would have considered absolute power. Men/Women have an ego and are vain, to some extent, as part of our human nature. And when you are treated better then the rest, given accolade after accolade, and treated like a king, you will act like one. The Founders collectively, knew this, and that is why they decided on a President of limited power, not a king. A President with limited powers which would run one third of the Federal Government with limited powers. More corrupt men, of the last few centuries, wished to control this limited government, and changed it through laws that crippled its limited scope, to give it more power, that they would control. Ben Franklin warned that the new government had the probability to be an all powerful government if not kept in check. As time went on they gave more and more power to the Congress, the Courts and the Office of the Presidency. In FDR's time the Progressives, through Congress and the President himself, gave the Presidency almost dictatorial powers. It finally took the People speaking out and electing brave men to lessen that power, at least temporarily. But those corrupt men found ways to grow the power of the Federal Government (State and local too) once again, and give the Courts, Congress and the Presidentcy more and more power. In the most modern times, as the power of the Government and the Presidency grew, 911 happened and was used was the mechanism to give the Government the most power ever since FDR and the President dictatorial power. Power that King George and FDR could have only dreamed about. So far, the corrupt powers that be, although they have the power to be absolute dictators, have only toyed with it to see what the American People would tolerate. Clinton and his using his government power to openly target his enemies and overcome moral objections to his personal behavior, Bush with his war powers and Obama and his pen writing executive orders making law to subvert the 2nd amendment. Clinton tried to see if his power would shield him from corruption, Bush tried to see if his power could make him immune to war mongering and Obama used his power to see if he could get away with rewriting the Constitution using his pen. All succeeded. One, keep working within the system, now corrupted by the evil corrupt men who wished and still wish to usurp power and authority form the People and the States, to change the system back to its original intent with the government beholden to the people, and not in charge of the people's every action. Two, Revolution, and force these men out of power and set government power back to the people, though this time all the people, not just rich, white males. Would this second choice be bloody? Maybe not. But the first time a Revolution as necessary it was. "Prudence, indeed, will dictate that Governments long established should not be changed for light and transient causes; and accordingly all experience hath shewn, that mankind are more disposed to suffer, while evils are sufferable, than to right themselves by abolishing the forms to which they are accustomed. But when a long train of abuses and usurpations, pursuing invariably the same Object evinces a design to reduce them under absolute Despotism, it is their right, it is their duty, to throw off such Government, and to provide new Guards for their future security." "The tree of liberty must be refreshed from time to time with the blood of patriots and tyrants. It is it's natural manure."